The key word is "attributed". Everyone selling will tell you that what they're selling is a Frazetta Abner but from what I understand, it's not that simple. Frazetta's involvement varied from strip to strip - maybe a little bit; maybe quite a bit and maybe nothing at all. He was part of Capp's (the REAL Al Capp ) stable of ghost artists. He was paid to ape Capp's style as were all of those artists - not to be his own man. Attribution is subjective and I'd bet Frank himself, if he were still with us, would be hard pressed to remember if he worked on a particular piece or not. Id'ing tangential involvement like a little bit of penciling or inking or just a panel could be difficult but an entire strip penciled and inked by Frazetta would not be too hard. Al "Capps" was the collector in question... beat me to it.... he was an "in-and-out whale" in the 90s. Got distracted by a new shiny bauble -- animation cells -- and traded "up" poorly. His comics would have been the better asset these past 25 years. I assume that's the delivery date written in the "M"...does it read 9-15﻿; 9-18; 9-25; 9-28 or something else? looks like 9-15 to me. Yes, that's what it looks like to me too. Must mean the store where Edgar brought his books received this copy of Marvel Comics 1 on September 15 which would line up perfectly with the November over printed date on the front cover of the book. Does seem a bit odd though since September 15th in 1939 falls on a Friday and I thought stores normally did not receive their books on a Friday. Or maybe it did in Denver? Well, we are still waiting..............it shouldn't take that long for a book to arrive here from Hong Kong. I've never owned a Timely yet. Fixed that for you since I thought an intelligent man like you would know by now that you should never say never. Especially when this book could be all yours for just the right price. Now, that's definitely a name from way back in the day and one that I haven't heard in a long time. I remember calling him once through all of those Private Collector ads he used to run in Overstreet during the early 90's asking for GA #1 keys and Marvel SA keys. Guess he gave up after a few years of running them since he told me that he was never ever really able to acquire a single book from those ads. 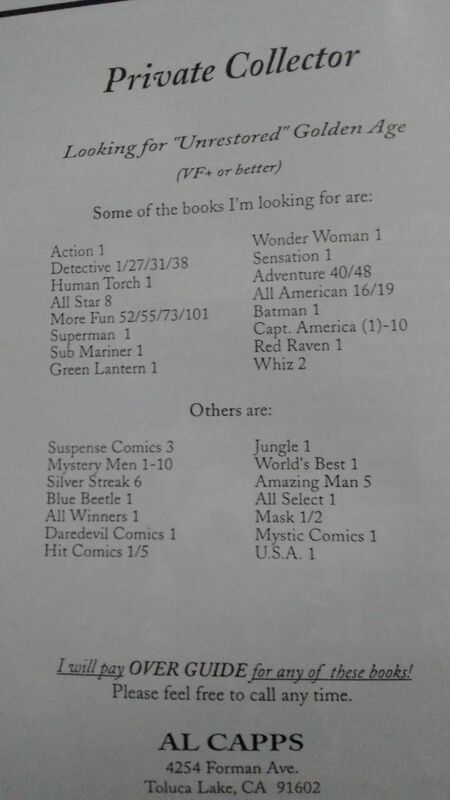 Any idea if he is still collecting or is he most likely gone like most of the other collectors back in the day? I think he was transitioning into Disney cels & memorabilia back then as he talked about it to me. We was in his late 60's back then, I'm not sure if he's alive at this point. How about a couple of the other big players back then like Pat Kochanek and Danny Kramer? Loved the articles that Kochanek wrote in the early issues of CBM about the Edgar Church collection, but sounds as though he might have shifted into original art or something else awhile back. I remember Kramer taking the marketplace by storm in the mid-90's trying to buy up everything, but like a flash in the pan was gone after that. I saw Kohanek a few years ago at the Chicago Con. He was out of comics but still into original art (comicbook and non-comicbook). I just talked to Kochanek last week. He is doing well. Building his Frazetta empire! At present, John Verzyl's closest family members, including his son, daughter & former wife maintain legal control of John's legacy collection (ergo, his Church Timely runs). There is another party who had a business relationship with John at the time of his passing and had access to portion of his sales inventory including, but not limited to, a modest number of Church books. As I understand it, that former associate is in the process of liquidating those assets. I have no knowledge of where those efforts stand, legally or otherwise, but to those curious or confused by this, rest assured that the bulk of John's collection is in safe keeping, held in trust by his immediate family. That collection is unlikely to find it's way into the marketplace in the foreseeable future. Hope this helps to fill in a few pieces of the puzzle. Don't know what their plans are, but I imagine some of both. Al invited over to his wonderful house one day to view his comics and original animation cels collection (his Snow White cels were amazing). A nice fellow. Told me that he was a musical jingle writer for top advertisers and companies. But then he completely dropped off the radar, never saw nor heard from him again (public records show the home as being sold three times since 1996). For those who missed the announcement by Dena the other day, CGC has officially renamed their registry awards as the John Verzyl Sr. Registry Awards. So the plethora of Edgar Church Timely Teen Humor books that were auctioned at Heritage last year were from a different collection? Based upon this ad, I remember calling him up one day way back when and he told me that he was never ever able to acquire a single book (or was it just one book only ) in all the years that he ran this ad. Not sure how true this statement was, but he certainly didn't get any books out from me. I wonder how many books Theo got from his bikini ad in Overstreet? Maybe not from the “Source” — meaning direct from a collector. But it sure put him on the map to dealers as to who to call to to sell expensive books to! I wonder how many people threw up when they saw it?